My friend Dennis, who happens to be a superb baker, preserve maker, gardener and cook, recently helped his great nieces create some fantastic puzzle piece sugar cookies for a school project of theirs. With the help of his two nieces, Dennis and company made dozens of multi-colored puzzle pieces which were gathered and arranged into cookie bouquets. The mission of this project was to let children know that we are all part of one great, big puzzle in life. 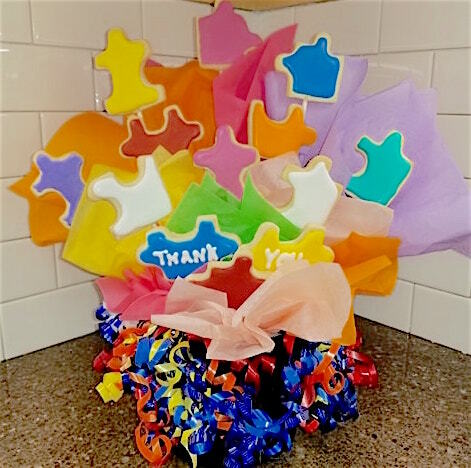 Puzzle pieces come in different shapes, sizes and colors, and every piece is essential. Every piece is valuable. The girls holding a printout of my recipe, along with the dough! 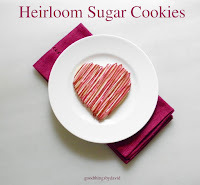 I was flattered that Dennis decided to use my Heirloom Sugar Cookie recipe for these colorful beauties, because it is one that I've come to trust time and time again. Needless to say, Dennis loved it and so did the kids. Dennis isn't one to do things on a small scale. 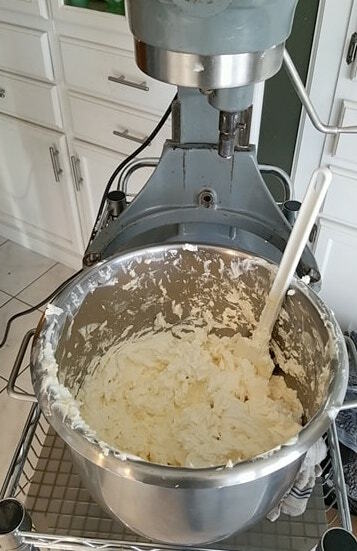 Using his large commercial Hobart mixer, pound after pound of sugar cookie dough was made in no time at all. Here is that beautiful cookie dough as it was coming together. Can you imagine having this 20qt. mixer? The machine itself weighs around 200 lbs!! 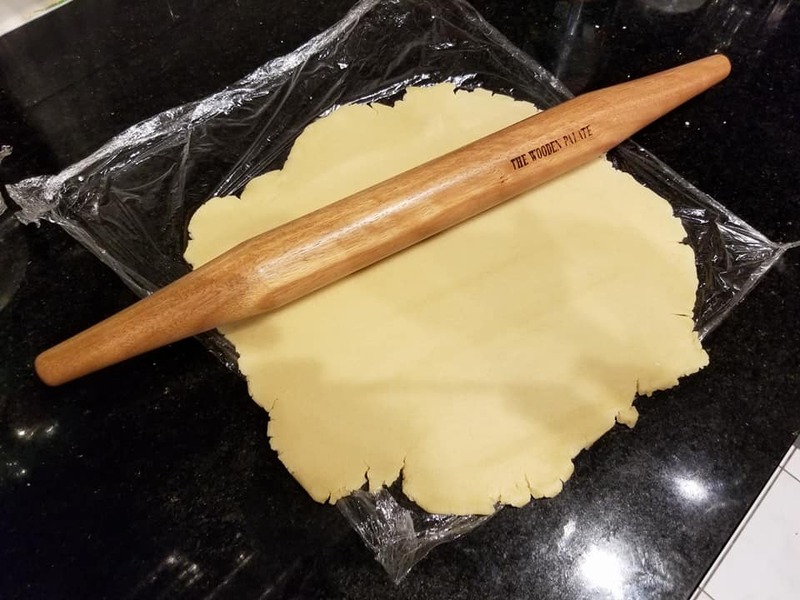 Using this French rolling pin which was given to Dennis by his friend Judy, the dough was rolled out to the desired thickness before the pieces were cut out. 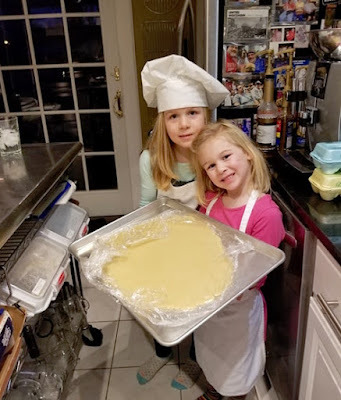 The girls took their duties seriously. 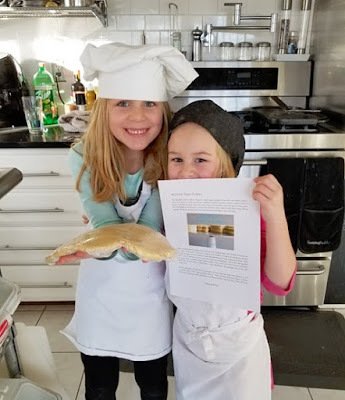 Dennis made sure to instruct them that the dough needed to chill thoroughly. I love this photograph because you can tell that Dennis, as a great uncle, and as the consummate baker, has taught his nieces to cut out as many shapes as possible, as close together as possible. 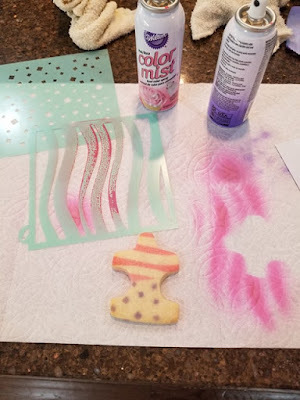 This is the way I like to work with sugar cookies, because it creates less scraps and less waste. 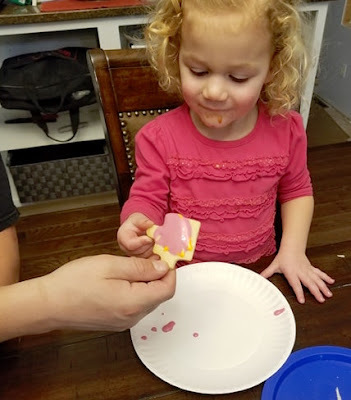 Working over a paper plate, the baked and cooled cookies were given some colorful royal icing. Some of the cookies were stenciled with food coloring spray. Very spiffy! 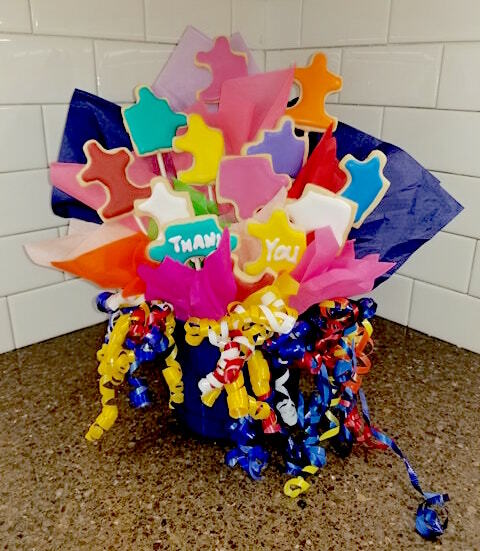 Once the cookies were dry, Dennis attached lollipop sticks to the backs of each cookie, and these were then carefully arranged in baskets, which were filled with the most colorful ribbons and tissue papers. Success! 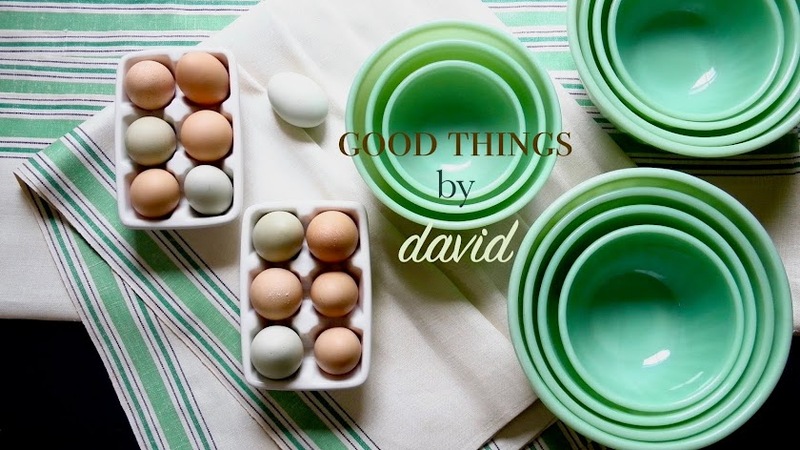 This kind of project is one that you can recreate in your own home. 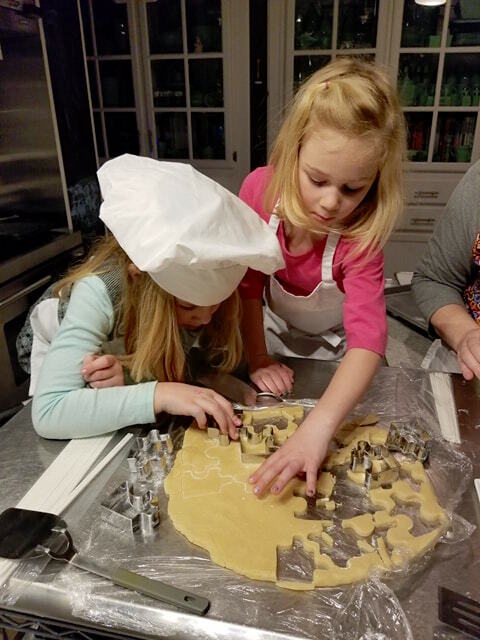 Cut out and bake sugar cookies in the shapes of puzzle pieces, make several batches of royal icing in bright colors, and assign the kids some simple tasks so that they are all a part of the big picture. 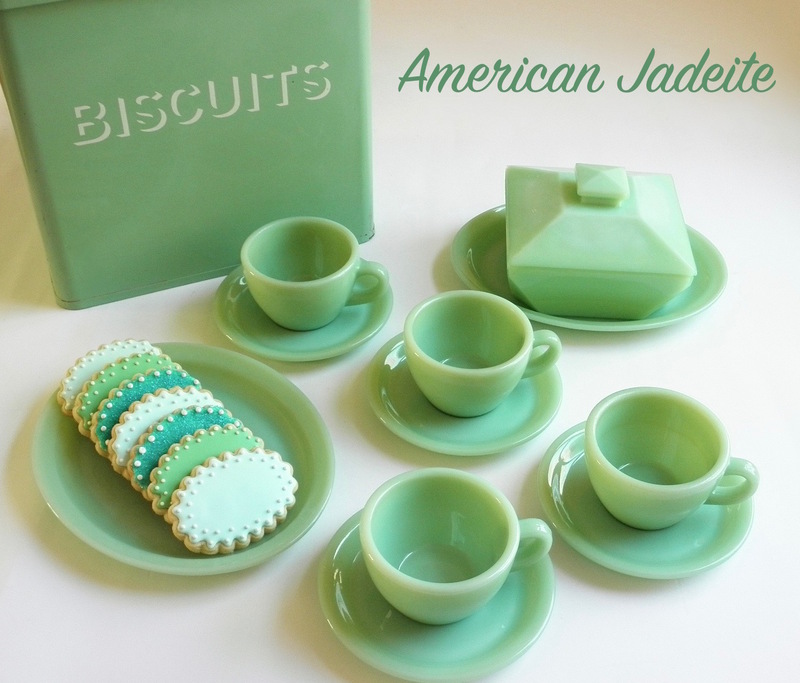 Before you know it, you'll have your own edible puzzle pieces. 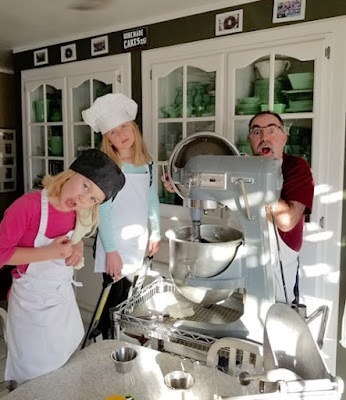 Many thanks to my friend Dennis and to his nieces for allowing me to share their remarkable creativity!